For Gordley, the recent push-backs against identifying preexistent hymns in the NT are worthwhile but need nuance. Gordley argues that the hymnic classification of these texts should be detached from speculation about their origin. While it may be impossible to conclude any hymn is a pre-existing composition, the recognition that it is a hymn is still beneficial. For example, this identification allows one to interpret the text in light of other ancient hymns. After an extensive summary of ancient Greco-Roman and Second Temple Jewish worship and hymns, Gordley devotes three chapters to in-depth analyses of Philippians 2:5-11, Colossians 1:15-20, and John 1:1-17. Other NT hymns (Eph 2:14-16; 1 Tim 3:16; Heb 1:1-4; 1 Pet 3:18-22; Lukan hymns; Rev 4-5) are considered more briefly in a single chapter. In the larger chapters, Gordley provides a brief history of scholarship with his own commentary and examines the text’s hymnic character and arrangement, possible influences (OT, Jewish/Roman literature), imperial context, and impact on the Christian community. As regards to the latter, Gordley argues that these hymns contain an element of “resistance poetry,” that is, they are identity-forming and hope-building in the face of various oppositions. This is a unique contribution of Gordley’s work. But what about the Christology? It is daunting to criticize this book. Gordley has clearly considered and researched these texts extensively. However, critique I must. By the time one hits the chapter on Philippians 2:5-11 (after 78 pages), it’s become clear that Gordley’s project is primarily one of historical backgrounds. He is less interested in interpreting the hymn’s content and more interested in its hymnic character, historical context, and impact on a community living within in the Roman Empire in the first century. In other words, Gordley attention is on nearly everything but the hymn’s message and theology. A careful reading of Gordley’s introduction indicates that this is no oversight. my aim is to provide a[n] … analysis of New Testament christological hymns in light of their cultural, literary and theological contexts .., situate them within the cultural matrices of Greco-Roman praise and … early Jewish worship, and argue that understanding those broader contexts allows for a richer understanding of how these passages functioned (p. 11). Gordley is not hiding his intent but one should be forgiven for expecting a discussion of these hymns’ theology and message. What it means, for example, that Jesus was given the name above all names (Phil 2:10). 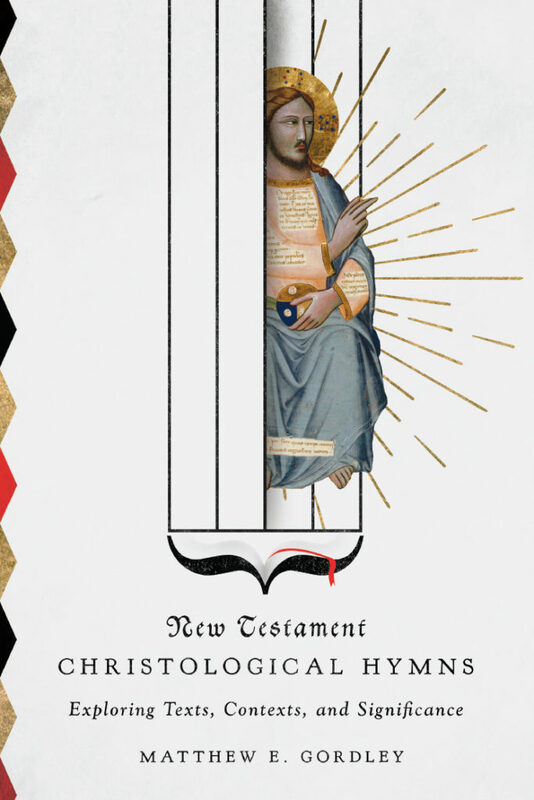 Perhaps Gordley did not choose his book’s title, but it is ironic that a book called New Testament Christological Hymns would largely skirt over christology of these texts. The value of this book, then, has to do with expectations. If one desires an in-depth study and synthesis of the theology and allusions to the OT in these passages, for example, this book will be disappointing. One, however will benefit greatly if desiring a broad and informed study of these passages’ hymnic character in the context of Greco-Roman and Jewish worship and hymns, the relevance for those living in the Roman Empire, and the identity-forming nature of these passages. Gordley is clearly a master in this field of NT hymns and their ancient contexts. Scholars and students who are investigating these hymns will certainly benefit from its insights. Gordley’s research and bibliography are extensive and he offers new insights. I question the benefit for pastors and laypeople hoping to understand the message and theology of these texts. Gordley has published several books and articles on these passages, but New Testament Christological Hymns presents the ripe fruit of his research in one affordable and accessible place. The contributions of this book should be read alongside commentaries that provide exegetical and theological analysis of the hymns themselves. Purchasing New Testament Christological Hymns from this link supports MDS. Many thanks to IVP Academic for providing a review copy.